Most collectors of Creek Chub baits have decided to specialize because of the depth and breadth of CCBCo's prodigious output during 60+ years of production (1916-1978/'79). Many enthusiasts have focused on certain popular colors while others may opt for a certain series such as the #700 Pikie or perhaps the #1500 Injured Minnow. These series (and many others) offer collectors an untold number of variations and colors to ponder. One area of "Creekchubology" that has been generally ignored centers on lures made of metal. Although these all-metal examples were a Creek Chub staple for over 50 years, they were never made in the same quantity or color selection that wood and plastic baits offered. Some fans have decided to collect a greater variety of CCBCo lures. 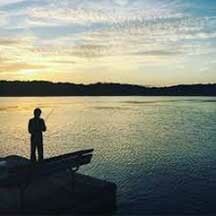 Many have discovered the challenge of locating prime condition metal baits. Over time, they have learned to appreciate the true rarity of certain Creek Chub lures produced in this material. These baits are arbitrarily divided into two categories: Those first offered before WWII (pre-war) and post-war examples. This study focuses on the examples initially offered to the public before WWII. 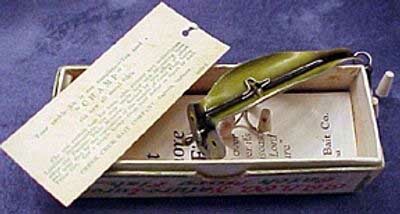 *The lure weights and lengths are taken from old CCBCo catalogs. Production dates: C.1927-1940 Length: 2 ¼" Weight: ¾ oz. This bait has heavily polished surfaces and a thick nickel plating over brass. The edges of the embossed scale design are flattened by the excessive polishing, resulting in a "refinished" appearance. 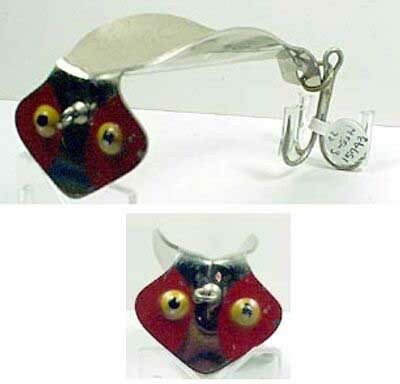 This lure was available in a nickel finish only and three different hook combos. This is the only metal bait included in one of the assortment boxes offered by CCBCo. 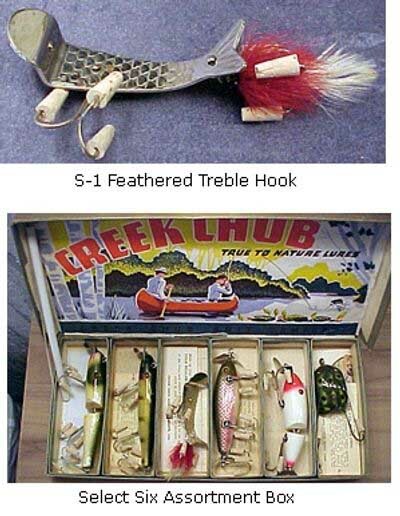 They sold combo boxes that held 3 or 6 lures during the 1920's-1930's. The Wicked Wiggler was part of the "Select-Six" assortment. These early Wicked Wigglers shouldn't be confused with the later "Cohokie", which had smaller hooks and NO washers on the hook holders. Production Dates: 1929-1940 Length: 2 ½" excluding hook Weight: 5/8 oz. Recognized by its unusual shape. Produced for anglers who preferred pork rinds added to their baits. 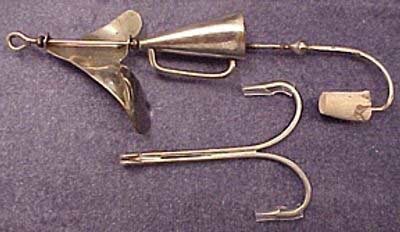 This lure incorporated a slow rotating front spinner, a lead filled megaphone-shaped section, a pork rind loop on the megaphone & a trailing single or double hook. The lure was shipped with both hooks, which could be interchanged by opening the pork rind loop. Made in nickel finish only. Production Dates: 1931-1940 Length: (spoon) 2 ¾" Weight: ¾ oz. A patented lure by CCBCo. Designed to wobble deep, but not twist the line. Any Sinful Sal is very difficult to find in premier condition with all the original hardware. Most specimens have missing parts and/or severe paint chipping on the spoon body. Locating all the colors in outstanding condition is a major challenge. These baits are plated on one side and painted on the other (except S20). Production Dates: 1936-1946 Length: 3 ¼" Weight: 5/8 oz. Creek Chub dubbed this lure their "metal Pikie". This was one of the best selling metal baits from CCBCo. The open curved body gave it a wiggling/roll action. The eyes are stamped into the metal & then painted, even on the all nickel finish. Hooks were held in place with metal clips. Sold as their "indestructible" lure. The smallest & generally most available of the 3 different types of Champs. Above: Musky & Salt Water Champ Box. Below: A Standard Large CCBCo Box. Production dates: 1937-1950 Length: 5" Weight: 1 ½ oz. A heavy duty lure that, as the name implies, was tough enough to bring in the wily Lake Trout, Muskies, Pike or light salt water fish. Equipped with two "quadruple strength treble hooks" held in place with metal clips. Available in the same colors as the smaller & more common S30 series Champ. However, some colors weren't offered during all production years of this "Musky" series. This & the S-50 series Salt Water Champs were shipped in a custom size two piece cardboard box with the standard "fish" design. It resembles the large boxes made for the Husky Pikie, Snook Pikie, etc. However these Champ boxes are deeper. Notice the difference in the adjacent photo. Production Dates: 1937-1950 Length: 5" Weight: 2.5 oz. No notch in the body which normally held the forward hook and clip on the other Champ series. A much thicker gauge metal than the S40 Musky Champ. Actual weight with one treble hook is 2.5 ozs. (3/4 of an ounce heavier than the Musky Champ). Earlier CCBCo catalogs confused the issue by showing the Salt Water Champ with two trebles. 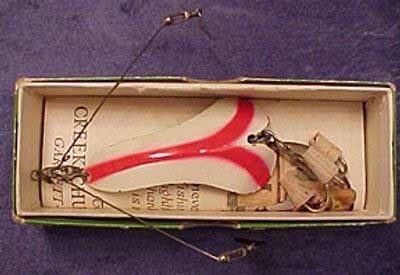 By 1941 they corrected the mistake & illustrated this lure with a tail hook only. This is the rarest of the 3 types of Champs. Not produced in all of the same colors as the other two series. Although not listed in other guidebooks, S-54 Yellow Scale was available as a catalog color for two years. Production Dates: 1936-1954 Length:1" Weight: Approximately 1/40 oz. The only all metal CCBCo fly rod lure. Although this series isn't as expensive as many early Creek Chub baits, some colors can be quite elusive. 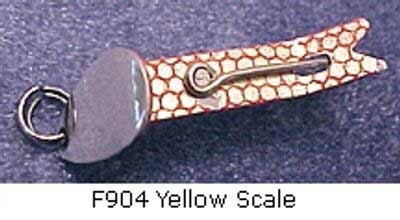 It is distinguished as a fly rod lure by its tiny size & the "F" prefix before the series numbers. Produced in six colors & finishes. Sometimes, it's difficult to differentiate the Yellow Scale from the Green Scale. Another CCBCo patented lure. A complete collection of pre-war CCBCo metal baits totals 33 catalog colors and/or plated finishes. Again, any series that BEGAN production before WWII is considered pre-war. Although assembling all 33 baits would be a formidable task, it would make a unique & impressive display. There are also several metal lures that began production AFTER WWII that are not part of this study.